Hey Dockercon, let’s get Physical! Overall, Dockercon did a good job connecting Docker users with information. In some ways, it was a very “let’s get down to business” conference without the open source collaboration feel of previous events. For enterprise customers and partners, that may be a welcome change. Unlike past Dockercons, the event did not have major announcements or a lot of non-Docker ecosystem buzz. That said, I miss that the event did not have major announcements or a lot of non-Docker ecosystem buzz. One item that got me excited was an immutable operating system called LinuxKit which is powered by a Packer-like utility called Moby (ok, I know it does more but that’s still fuzzy to me). RackN CTO, Greg Althaus, was able to turn around a working LinuxKit Kubernetes demo (VIDEO) overnight. This short video explains Moby & LinuxKit plus uses the new Digital Rebar Provision in an amazing integration. Want to hear more about immutable operating systems? Check out our post on RackN’s site about three challenges of running things like LinuxKit, CoreOS Container Linux and RancherOS on metal. Oh, and YES, that was my 15-year-old daughter giving a presentation at Dockercon about workplace diversity. I’ll link the video when they’ve posted them. IT is subject to seismic shifts right now. Here’s how we cope together. For a long time, I’ve advocated for open operations (“OpenOps”) as a way to share best practices about running data centers. I’ve worked hard in OpenStack and, recently, Kubernetes communities to have operators collaborate around common architectures and automation tools. I believe the first step in these efforts starts with forming a community forum. I’m very excited to have the RackN team and technology be part of the newly formed Infrastructure Masons effort because we are taking this exact community first approach. An Infrastructure Mason Partner is a professional who develop products, build or support infrastructure projects, or operate infrastructure on behalf of end users. Like their end users peers, they are dedicated to the advancement of the Industry, development of their fellow masons, and empowering business and personal use of the infrastructure to better the economy, the environment, and society. We’re in the midst of tremendous movement in IT infrastructure. The change to highly automated and scale-out design was enabled by cloud but is not cloud specific. This requirement is reshaping how IT is practiced at the most fundamental levels. We (IT Ops) are feeling amazing pressure on operations and operators to accelerate workflow processes and innovate around very complex challenges. Open operations loses if we respond by creating thousands of isolated silos or moving everything to a vendor specific island like AWS. The right answer is to fund ways to share practices and tooling that is tolerant of real operational complexity and the legitimate needs for heterogeneity. Interested in more? Get involved with the group! I’ll be sharing more details here too. Greg Althaus, RackN CTO, creates amazing hybrid DevOps orchestration that spans metal and cloud implementations. When it comes to knowing the nooks and crannies of data centers, his ops scar tissue has scar tissue. So, I knew you’d all enjoy this funny story he wrote after previewing my OpenStack API report. 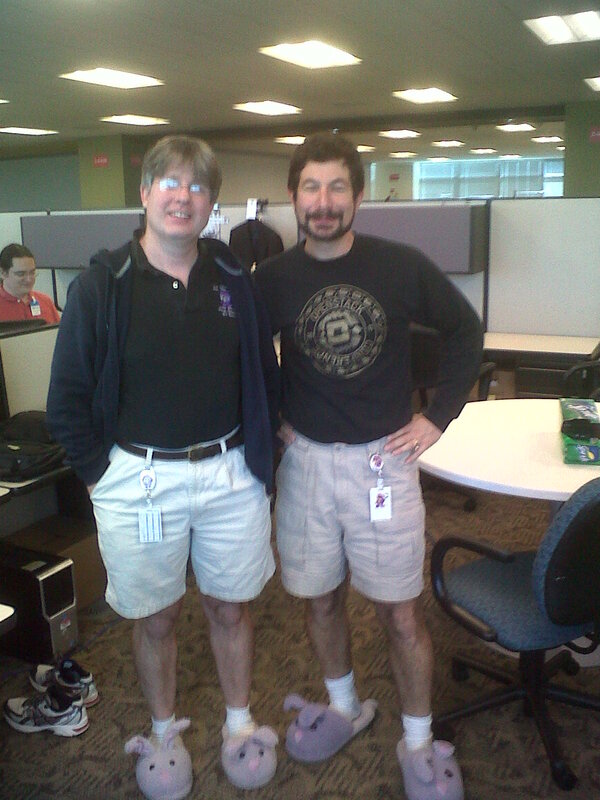 While building the Digital Rebar OpenStack node provider, Rob Hirschfeld tried to integrate with 7+ OpenStack clouds. While the APIs matched across instances, there are all sorts of challenges with what comes out of the API calls. The discovery made me realize that APIs are not the end of interoperability. They are the beginning. I found I could best describe it with a story. I found an API on a service and that API creates a Wookiee! I can tell the API that I want a tall or short Wookiee or young or old Wookiee. I test against the Kashyyyk service. I consistently get a 8ft Brown 300 year old Wookiee when I ask for a Tall Old Wookiee. I get a 6ft Brown 50 Year old Wookiee when I ask for a Short Young Wookiee. Exactly what I want, all the time. My pointy-haired emperor boss says I need to now use the Forest Moon of Endor (FME) Service. He was told it is the exact same thing but cheaper. Okay, let’s do this. It consistently gives me 5 year old 4 ft tall Brown Ewok (called a Wookiee) when I ask for the Tall Young Wookiee. This is a fail. I mean, yes, they are both furry and brown, but the Ewok can’t reach the top of my bookshelf. The next service has to work, right? About the same price as FME, the Tatooine Service claims to be really good too. It passes tests. It hands out things called Wookiees. The only problem is that, while size is an API field, the service requires the use of petite and big instead of short and tall. This is just annoying. This time my tall (well big) young Wookiee is 8 ft tall and 50 years old, but it is green and bald (scales are like that). I don’t really know what it is. I’m sure it isn’t a Wookiee. And while she is awesome (better than the male Wookiees), she almost froze to death in the arctic tundra that is Boston. My point: APIs are only valuable if the parameters mean the same thing and you get back what you expect. 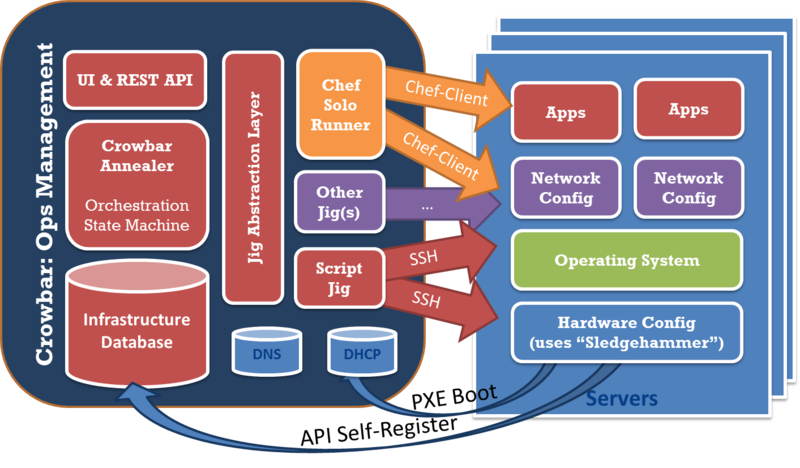 Delicious 7 Layer DIP (DevOps Infrastructure Provisioning) model with graphic! Applying architecture and computer science principles to infrastructure automation helps us build better controls. In this post, we create an OSI-like model that helps decompose the ops environment. The RackN team discussions about “what is Ready State” have led to some interesting realizations about physical ops. One of the most critical has been splitting the operational configuration (DNS, NTP, SSH Keys, Monitoring, Security, etc) from the application configuration. Interactions between these layers is much more dynamic than developers and operators expect. In cloud deployments, you can use ask for the virtual infrastructure to be configured in advance via the IaaS and/or golden base images. In hardware, the environment build up needs to be more incremental because that variations in physical infrastructure and operations have to be accommodated. Greg Althaus, Crowbar co-founder, and I put together this 7 layer model (it started as 3 and grew) because we needed to be more specific in discussion about provisioning and upgrade activity. The system view helps explain how layer 5 and 6 operate at the system layer. shared infrastructure – the base layer is about the interconnects between the nodes. In this model, we care about the specific linkage to the node: VLAN tags on the switch port, which switch is connected, which PDU ID controls turns it on. firmware and management – nodes have substantial driver (RAID/BIOS/IPMI) software below the operating system that must be configured correctly. In some cases, these configurations have external interfaces (BMC) that require out-of-band access while others can only be configured in pre-install environments (I call that side-band). operating system – while the operating system is critical, operators are striving to keep this layer as thin to avoid overhead. Even so, there are critical security, networking and device mapping functions that must be configured. Critical local resource management items like mapping media or building network teams and bridges are level 2 functions. operations clients – this layer connects the node to the logical data center infrastructure is basic ways like time synch (NTP) and name resolution (DNS). It’s also where more sophisticated operators configure things like distributed cache, centralized logging and system health monitoring. CMDB agents like Chef, Puppet or Saltstack are installed at the “top” of this layer to complete ready state. applications – once all the baseline is setup, this is the unique workload. It can range from platforms for other applications (like OpenStack or Kubernetes) or the software itself like Ceph, Hadoop or anything. operations management – the external system references for layer 3 must be factored into the operations model because they often require synchronized configuration. For example, registering a server name and IP addresses in a DNS, updating an inventory database or adding it’s thresholds to a monitoring infrastructure. For scale and security, it is critical to keep the node configuration (layer 3) constantly synchronized with the central management systems. cluster coordination – no application stands alone; consequently, actions from layer 4 nodes must be coordinated with other nodes. This ranges from database registration and load balancing to complex upgrades with live data migration. Working in layer 4 without layer 6 coordination creates unmanageable infrastructure. This seven layer operations model helps us discuss which actions are required when provisioning a scale infrastructure. In my experience, many developers want to work exclusively in layer 4 and overlook the need to have a consistent and managed infrastructure in all the other layers. We enable this thinking in cloud and platform as a service (PaaS) and that helps improve developer productivity. We cannot overlook the other layers in physical ops; however, working to ready state helps us create more cloud-like boundaries. Those boundaries are a natural segue my upcoming post about functional operations (older efforts here). While “ready state” as a concept has been getting a lot of positive response, I forget that much of the innovation and learning behind that concept never surfaced as posts here. The Anvil (2.0) release included the OpenCrowbar team cataloging our principles in docs. Now it’s time to repost the team’s work into a short series over the next three days. In architecting the Crowbar operational model, we’ve consistently twisted adapted traditional computer science concepts like late binding, simulated annealing, emergent behavior, attribute injection and functional programming to create a repeatable platform for sharing open operations practice (post 2). Ok, maybe that’s not going to be the 70’s era hype bubble name, but… the operational model behind Crowbar is entering its third generation and its important to understand the state isolation and integration principles behind that model is closer to functional than declarative programming. The model is critical because it shapes how Crowbar approaches the infrastructure at a fundamental level so it makes it easier to interact with the platform if you see how we are approaching operations. Crowbar’s goal is to create emergent services. We’ll expore those topics in this series to explain Crowbar’s core architectural principles. Before we get into that, I’d like to review some history. Crowbar delivers repeatable best practice deployments. Crowbar is not just about installation: we define success as a sustainable operations model where we continuously improve how people use their infrastructure. The complexity and pace of technology change is accelerating so we must have an approach that embraces continuous delivery. Crowbar’s objective is to help operators become more efficient, stable and resilient over time. When Greg Althaus (github @GAlhtaus) and Rob “zehicle” Hirschfeld (github @CloudEdge) started the project, we had some very specific targets in mind. We’d been working towards using organic emergent swarming (think ants) to model continuous application deployment. We had also been struggling with the most routine foundational tasks (bios, raid, o/s install, networking, ops infrastructure) when bringing up early scale cloud & data applications. Another key contributor, Victor Lowther (github @VictorLowther) has critical experience in Linux operations, networking and dependency resolution that lead to made significant contributions around the Annealing and networking model. These backgrounds heavily influenced how we approached Crowbar. Heterogeneous Operating Systems – chose which operating system you want to install on the target servers. CMDB Flexibility (see picture) – don’t be locked in to a devops toolset. Attribute injection allows clean abstraction boundaries so you can use multiple tools (Chef and Puppet, playing together). without injecting “crowbarisms” that were previously required. So you can share your learning with the broader DevOps community even if they don’t use Crowbar. Node Discovery (or not) – Crowbar maintains the same proven discovery image based approach that we used before, but we’ve streamlined and expanded it. You can use Crowbar’s API outside of the PXE discovery system to accommodate Docker containers, existing systems and VMs. Hardware Configuration – Crowbar maintains the same optional hardware neutral approach to RAID and BIOS configuration. Configuring hardware with repeatability is difficult and requires much iterative testing. While our approach is open and generic, the team at Dell works hard to validate a on specific set of gear: it’s impossible to make statements beyond that test matrix. Network Abstraction – Crowbar dramatically extended our DevOps network abstraction. We’ve learned that a networking is the key to success for deployment and upgrade so we’ve made Crowbar networking flexible and concise. Crowbar networking works with attribute injection so that you can avoid hardwiring networking into DevOps scripts. Out of band control – when the Annealer hands off work, Crowbar gives the worker implementation flexibility to do it on the node (using SSH) or remotely (using an API). Making agents optional means allows operators and developers make the best choices for the actions that they need to take. Technical Debt Paydown – We’ve also updated the Crowbar infrastructure to use the latest libraries like Ruby 2, Rails 4, Chef 11. Even more importantly, we’re dramatically simplified the code structure including in repo documentation and a Docker based developer environment that makes building a working Crowbar environment fast and repeatable. OpenCrowbar (CB2) vs Crowbar (CB1)? Why change to OpenCrowbar? This new generation of Crowbar is structurally different from Crowbar 1 and we’ve investing substantially in refactoring the tooling, paying down technical debt and cleanup up documentation. Since Crowbar 1 is still being actively developed, splitting the repositories allow both versions to progress with less confusion. The majority of the principles and deployment code is very similar, I think of Crowbar as a single community.